So my weeks of utter slackage have apparently come to an end. After more days off than I’d like to admit, I got back on that horse called knitting. I only got about 10 rows done in the space of this episode, but hell, that’s 10 more rows than I’ve done in… Whoops. I almost admitted it! I told you I don’t like to do that. Anyway, it felt good to get back at it. Let’s hope this trend continues. Does it count as a trend if I’ve only done it once? No? Drat. Ok, so The Doctor’s Wife. I love this episode. 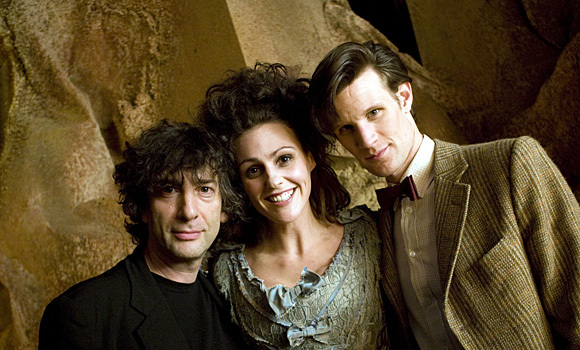 It’s no secret that Neil Gaiman is one of my favorite authors, so when I heard he was writing a script for Doctor Who (years ago when he first mentioned it on his blog), I was thrilled! I was also pretty apprehensive. I mean, I love his work, but this is Doctor Who. It’s practically sacred. But I decided I could probably trust Neil to do it justice. I’ve known for ages what a huge Who fanboy he is; I know what he’s capable of writing-wise; and I knew Steven Moffat was at the helm and would likely not steer us wrong, so…let’s just say I remained hopeful. My cheerful optimism proved well-founded. This story was positively lovely. I hadn’t seen The Doctor’s Wife since it aired, and I’m rather wishing I’d watched it again recently before trying to watch it with commentary. It was occasionally difficult to avoid ignoring the voices in my head(phones) while I fixated on the screen. Luckily, Steven, Warren, and Chris from Radio Free Skaro are pretty damn amusing, so that didn’t happen as often as it could have. I definitely recommend checking out their series 6 commentaries. This one in particular held several laugh-out-loud moments for me. The best of all being Steven’s Ribos Operation quotation (ooh! a rhyme! ): “What’s a hole doing in my TARDIS?” Thank god I wasn’t drinking anything or that would have been a legitimate spit take and my laptop would have paid the price. Other commentary highlights include more agendas than you can shake a stick at, fun with Nazi fashion, glowing cleavage, and many of the usuals like Matt Smith-adoration and the obligatory trips into the gutter with tour-guide Chris. As for this episode itself, I don’t think I’m alone in ranking it as one of the best of series 6. Part of what I like most is the fact that it really doesn’t fit into the overall arc of the series. This one really stands alone. Now I’m usually a sucker for a story arc, but in this case, I was pretty pleased to just get away from that for a while. I think any addition of arc-related nonsense would have only muddied things here. Better to keep the love story between the Doctor and Idris pure and unsullied. And that’s really what this was–a love story. The most beautiful love story in the history of the show in my semi-humble opinion. And as Steven said in the commentary, “it’s the only one I can ever believe.” Nothing before or since can come close. This entry was posted in FangirlKnits and tagged commentary, Doctor Who, Matt Smith, Neil Gaiman, Radio Free Skaro, Steven Moffat.